So, I went for it. 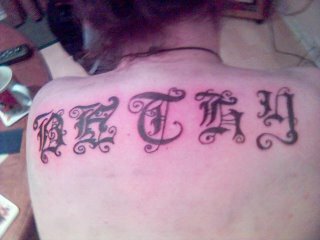 Chose a font, chose BETHY, gritted my teeth, and voila! Two hours of pain, and here we are again. Correction. I say "pain" but what I actually mean is "Excruciating Bloody Agony". I can handle pain, I live with it daily, I've broken most bones in my body, but nothing could have prepared me for this back tattoo. Now, when it comes to tattoo's, there is the Lining Needle (which is the outline), and the Colouring Needle (which is used, amazingly, for colouring). The liner is the painful one, the colouring a dull pain. Not this time, oh no. The liner felt like a soldering iron, and the colouring felt like sandpaper and rubbing alcohol. And it got worse. But, being a man (and knowing I'd probably not have it finished) I wanted it done in one hit. The most painful part? 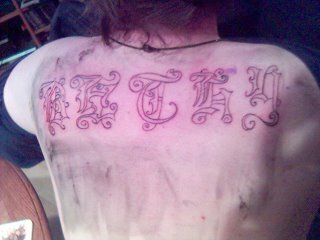 The skin directly over my spine. THAT was bloody painful, but all in all, it hurt a lot. I make no bones about it! It'd probably have been somewhat less painful had I decided on a less arty script, but none the less, I wanted it done. No, I NEEDED it done. I can't explain it, but it was just something I needed to do for Bethy. Would I do it again? Not a chance. But it looks the business! The photo doesn't do it much justice, as it was taken on my trusty ol' mobile phone - once it's healed up (or tomorrow, assuming I remember!) I will get a decent picture taken.